Austria is a land-locked country in Central Europe bordered by Germany, Czech Republic, Slovakia, Hungary, Slovenia, Italy, Switzerland, and Liechtenstein. Its territory covers about 33,000 square miles and has a population just over 8 million. Christianity was introduced following conquest of the area by the Frankish King Charlemagne – more than 70% of Austrians are Catholic Christians.During World War II, Austria became part of the Third Reich – following the defeat in World War II, Austria was divided into four zones and governed by the Allied Commission for Austria. It gained full independence on May 15, 1955. 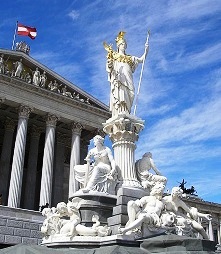 Austria’s well developed market economy and very large tourism industry together accounts for its status as one of the twelve richest countries of the world. Many tourists come to experience Austria’s musical heritage and Salzburg along with the rest of the country have many offerings at moderate prices. Summer festivals abound as well, the most famous of which is the avant-garde Salzburg festival. Regardless of the season Vienna charms all. Hiking and cycle touring are other popular activities. The best time to visit is obviously during summer, but May and November get the honors for being the tourist friendly months. Austrian cuisine though tasty tends to be on the heavy side. DK Eyewitness Travel Guide: Austria 978-0756661045 $17 A detailed introduction to Vienna, and the major regions followed by practical information such as where stay, eat, and shop along with activities and other travel info. Fabulous photos! Vienna by Eyewitness Travel Guides 978-0756661014 $16 Ideal for a first trip to Vienna for a few days. Streetwise Vienna Map 978-1931257480 $8 Laminated. Main Vienna Map scale: 1:23,000 and Central Vienna Map scaled at 1:11,000. Vienna Metro Map. Streets, Hotels, Metro Stations, Places of Interest, etc. are marked. Kaffeehaus: Exquisite Desserts from the Classic Cafes of Vienna, Budapest, and Prague by Clarkson Potter 978-0965360784 $40 Over 120 authentic recipes and a guide to the famous coffee houses in the Austro-Hungarian Empire. Great for a foodie or just anyone interested in the culinary history of the region. The first stamps of Austria were a definitive set of 5 stamps (Scott #1 to #5) with the “Coat of Arms” theme in five denominations (1, 2, 3, 6, and 9 Kruezer) each with a different color (yellow, black, red, brown, and blue respectively) released in 1850. The printing till 1854 used a crude production method that combined rough hand-made paper in varying thickness with “K.K.H.M.” (initials of the German term for the “Imperial and Royal Ministry of Commerce”) watermark in the vertical gutters in the panes. Later productions used machine made paper with no watermark.The first issues were used until 1858 and several varieties exist. Used single copies are somewhat common and fetch between $2 and $100 depending on denomination and variety – the 3kr red and the 9kr blue catalog for around $3 while the 1kr yellow catalogs for around $100. Unused copies are a lot rarer and fetch between $500 (3kr red on machine made paper Type III) and $2000 (9kr blue on hand made paper). Some varieties, blocks, and bisected copies on cover are even rarer and fetch a lot more – for example, few copies of the diagonally bisected 2kr Black on cover exist and fetch upwards of $25000. Also, few copies of First Day Cover cancellations of these stamps exist and they fetch between $20000 (3kr red) and $60000 (2kr black) – First Day Cover showing 1kr yellow is not known to exist. In 1858, Austria issued their second set of designs that show Emperor Franz Josef (Scott #6 to #11) in five different denominations (2kr, 3kr, 5kr, 10kr, and 15kr) and six different colors (yellow, black, green, red, brown, blue) – the issues were denominated in Neu-Kreuzer following conversion to the decimal system in the beginning of that year. Unused copies of these stamps are rare and fetch a big premium – they catalog for between $500 (5kr red) and $2500 (3kr black) – the corresponding used copies catalog for between $1 and $200. Different designs of the Coat or Arms and Franz Josef themes continued until 1908. Many of these stamps are rare and fetch a sizable premium. A large set of 15 stamps (Scott #70 to #85) in the Franz Josef theme was released in 1899 – the issue was significant as it represented the first stamps represented in Heller, the currency that was used from 1892 till the dissolution of the Austria-Hungary Empire (1916). The set catalogs for around $250 for MNH and about one-tenth that for used. The aftermath of World War I saw inflation spiking in Austria and a set of stamps issued in 1922 demonstrates this fact nicely – the large set of 37 stamps (Scott #250 to #287) has denominations that range from 1/2k to 4000k in two different designs (“Symbols of Agriculture” and “Symbols of Labor and Industry”). The set is remarkably affordable at less than $20 catalog value for a used set – a mint set catalogs for double that and MNH set about six times that. A sister set in a “Symbols of Arts and Science” design was also released in the same time period in a separate set (Scott #288 to #298) – this set has denominations from 20k to 10000k. This set is also very affordable at less than $10 for used and about three times that for mint and slightly higher for MNH. In 1924, the currency in Austria was changed to Groschen Shilling and the stamps that followed were denominated in this new currency. Austria did not issue any stamps between 1937 and 1945 as the Anschluss resulted in Austria using German stamps until the end of World War II. The period started with a transition arrangement whereby both German and Austrian stamps were required and covers that show mixed franking exist and fetch sizable premium. After World War II, in the early months of 1945, Austrian stamps consisted of overprints of German stamps, many depicting Hitler with the face fully or partially stroked-through. The overprints, style, and designs varied depending on the zone the stamps were issued and used. A few of the Hitler overprints are very valuable (Scott #428 to #431 and #398 to #404) with a catalog value of $750 and $75 respectively for MNH sets, but counterfeits exist and so collectors need to exercise a great deal of caution before investing in any of them. In the latter months of 1945, stamps with the “Republik Osterreich” inscription replaced the German overprints – first themes included the “Coat of Arms”, and Austrian local scenes. A set of 37 definitive stamps (Scott #520 to #556) issued from 1948 to 1952 showing different Austrian Costumes. The set catalogs for less than $20 used and around $50 mint with MNH about 5 times higher. Part of this set (21 denominations) were reissued in 1958-59 and is valued somewhat less – it is distinguishable by the fact that they are printed in white paper as opposed to gray paper used in the earlier set. During the first 10 years following World War II, the overwhelming theme that dominated Austrian stamp issues were the long series of stamps/sets issued in the ‘Great People’ theme. Most of these catalogs for a few dollars with a few higher denominations cataloging somewhat higher. One interesting short-set from the series is the 1950 issue of four stamps (Scott #568 to #571) depicting great people of Austria from different fields (Alexander Girardi – Actor, Moritz Michael Daffinger – painter, Andreas Hofer – patriot/politician/martyr, and Josef Madersperger - inventor). The set catalogs for around $30 for used or MNH. On May 15, 1955, Austria issued a stamp overprinted “STAATSVERTRAG 1955” (Scott #604) to mark the signing of the Austrian Treaty of Independence with the US, France, Great Britain, and Russia – representatives of the four zones governed by the Allied Commission for Austria following the division after World War II. This stamp is remarkably affordable at less than $3 for MNH and less than a dollar for used. Between 1973 and 1978, Austria issued a long set of definitive stamps (Scott #958 to #976) that depict Austrian local scenes in a uniquely beautiful design. The single color border along with a combination of white background and single-color main design in the center makes these stamps instantly recognizable. The set catalogs for around $20 MNH and a few dollars for used. Between 1993 and 1995, Austria issued a set of ten definitive stamps that show Christian theme. The set (Scott #1599 to #1608) is also notable because of its original unique design and catalogs for around $20 MNH and a few dollars for used. In 2002, Austria released a short set of three stamps in the “Promotion of Youth Philately” theme. The three different designs used cartoon characters in beautiful multi-colors. The set (Scott #1885 to #1887) catalogs for around $5 for either MNH or used. Austria issued a number of stamps over the years celebrating famous painters, especially Gustav Klimt, the Symbolist painter. One such issue is the mini-souvenir sheet (Scott #1938) released October 10, 2003 that show Gustav Klimt’s ‘Judith I’. The souvenir sheet catalogs for around $5 for either MNH or used. The first coins in present-day Austrian territory were from the 2nd century BC minted by the Vindelici, Boii, and Norici Celtic tribes. The Kreuzer denomination in coins dates back to the early 17th century. The era of uniform coinage started in 1812 when copper coins with mintage well into the millions were issued. The coins are not especially valuable cataloging in the $25 range for UNC. Bullion $5 and up Silver Philharmonikers starts around $5. The hugely popular Philharmonics (gold 0.1oz and up) introduced in 1989 start around $100. Gold Coins $80 and up Franz Josef Trade Coinage (1901 to 1915) start around $80 for circulated. Certified gold coins graded MS60 and up go well into the 100s. First gold coins introduced in 1858 enjoy low mintage and some scarce dates (1863A) go well into the 10s of 1000s for UNC. Other Coins $1 and up Common coins in VF start around $1. Early 20th century high mintage issues in VF start around $5. Silver proofs from the 60s start around $25. Early 19th century coins in UNC start around $100. Graded and certified coins from the 17th century and prior dates go well into the 100s. Paper Money $2 and up Notgeld UNC notes start around $2. Scarce VF notes from WWI and WWII start around $50. 100 Schilling UNC notes from the 50s and 60s start around $100. Exonumia $10 and up Franz Josef Tokens and Medals from the 19th century start around $10. Early 18th century medals, Great World Medals, etc start around $100. Austria is seriously into art and music and the rich experience of absorbing them in person is an experience beyond words. Confectioneries, pure silk scarves and ties, art, antiques, and jewelry are only some of the effects visitors chose to take as their reminder of this country. Antiques $50 and up Authentic 19th century vases, ceramics, and silverware start in the hundreds. Art $5 and up Prints of 19th century art start around $5. Framed prints start a little higher and original signed work from famous artists like Carl Pippich and Rudolf Konopa go into the 1000s. Jewelry $10 and up Austrian crystal brooches and earrings start around $10 and go all the way into the 100s. Genuine signed Rhinestone articles fetch a huge premium. Pottery $5 and up Vintage Art Nouveau and other branded pieces from Royal Vienna and others fetch a good premium.